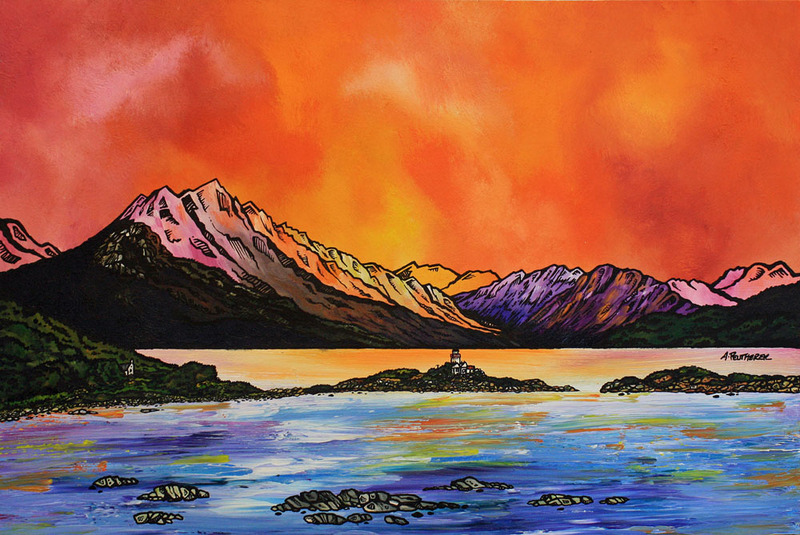 Painting & prints of Skye - Ben Sgritheal & Isle Ornsay, Scotland. An original painting & prints of Ben Sgritheal, Isle Ornsay & Sound Of Sleat, Isle Of Skye, Scotland. An original abstract, atmospheric landscape painting of Ben Sgritheal, Isle Ornsay & Sound of Sleat, Isle of Skye, Scotland. Skye painting & prints – Ben Sgritheal & Isle Ornsay, Scotland by Scottish landscape artist A Peutherer. Paintings & Prints of Skye - Isle Of Skye, Dusk Over Ben Sgritheal and Isle Ornsay, Sound Of Sleat, Scotland.